I set out today to visit Gamble Place at Spruce Creek in Port Orange, Florida today, however the buildings are undergoing restoration and maintenance. To be honest, I thought I had arrived in the wrong place, since I ended up at someones private residence. I did, however, notice a visitor's center at Cracker Creek where I met a lovely lady that explained to me where I was actually at. Cracker Creek actually resides on the original homestead of Roland F. Johnson. He was the caretaker for the Gamble Estate, and lived in a cabin on the property. In 1933, he built a home for his wife Lela E. Miller, however sadly she died before it was finished. James Gamble, the owner of Gamble Place, came to the area around the late 1800's. 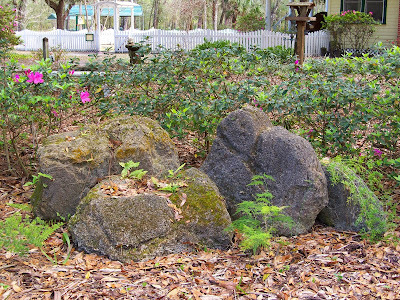 Of course, the 175 acres of nature preserve was quite appealing, so it wasn't a surprise that he should settle in this pristine and private area of Port Orange, Florida. What I found immensely interesting, and if you haven't figured it out just yet, James Gamble is associated with Proctor and Gamble. Color me surprised, especially considering I'm from Ohio and I'm very familiar with Proctor and Gamble. Furthermore, being that James was a wealthy Cincinnati businessman, it's surprising that he built his Cracker-style cottage in the middle of the county to compliment a more luxurious seasonal estate along the Halifax River. Cracker Creek is adjacent to Gamble Place and offers Eco-History Pontoon Boat Tours Thursday through Sunday at 11am and 2pm. Kayak and Canoe rentals are available Thursday to Sunday from 8 am to 5pm. I actually got the chance to investigate the Creek without signing up to canoe, but it was splendid. I think the biggest surprise for me at Cracker Creek was the bamboo. I have never seen such a display in Florida before, it just seemed odd to see it right in my backyard. Consequently, the other surprise which almost scared me out my flip flops was the peacock trying to get my attention. Sounds like a very interesting place. I'm not familiar with Ohio so I don't know why he chose Florida, cool looking place though. A fun post..Thanks for sharing it.